President Donald J. Trump enters the Charleston Civic Center to the cheers of supporters. President Donald J. Trump speaks during Tuesday’s rally in Charleston. 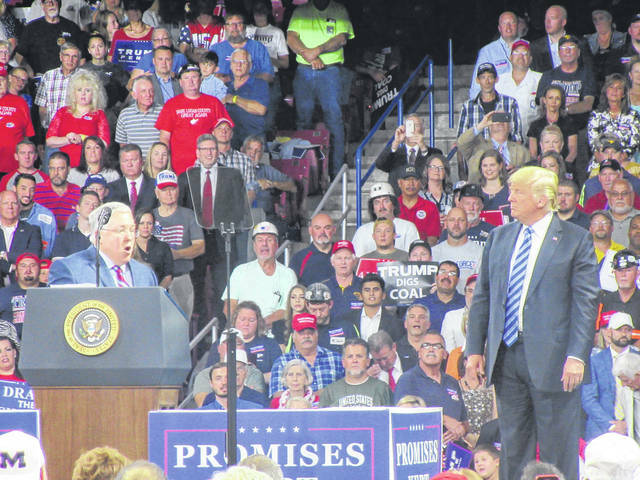 West Virginia Attorney General (and Senate candidate) Patrick Morrisey took to the stage along with President Donald J. Trump. 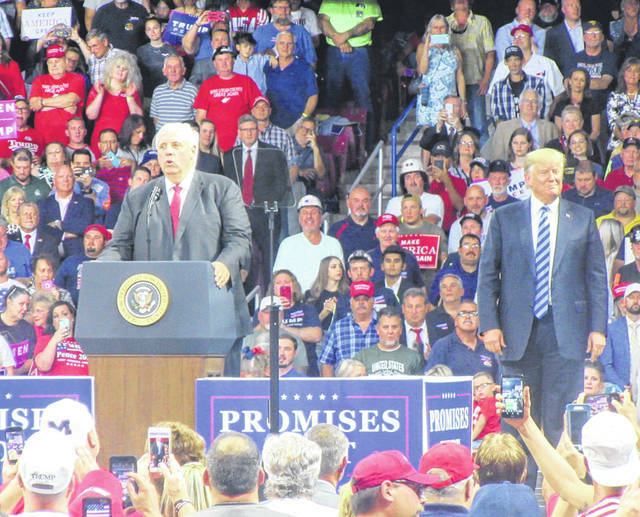 Governor Jim Justice speaks as President Donald J. Trump looks on during Tuesday’s rally. 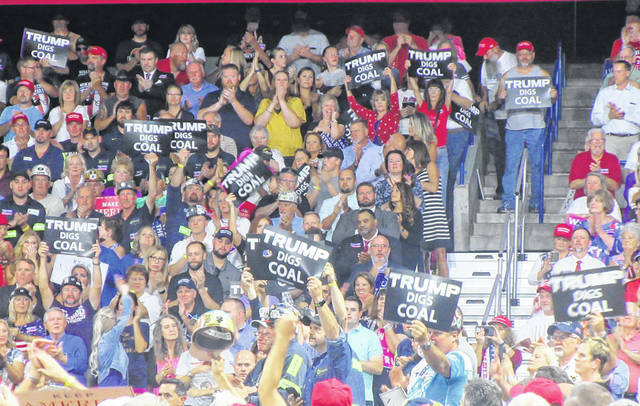 Supporters hold “Trump Digs Coal” signs during the rally. Supporters waved signs including “Keep America Great” as President Donald J. Trump took to the podium. 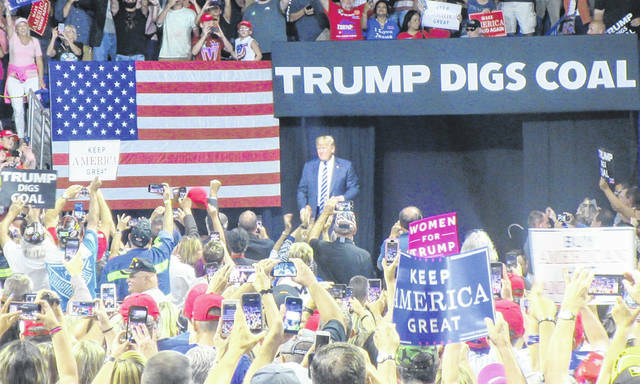 CHARLESTON — Taking to the stage for a rally in West Virginia on Tuesday night, President Donald J. Trump focused on the successes of his presidency to date, as well as his support for fellow Republicans in the upcoming midterm elections. Trump made little reference to the conviction/guilty plea of his former confidants — former campaign chairman Paul Manafort and personal attorney Michael Cohen — which took place shortly before the President’s hour-plus speech. Inside the Charleston Civic Center things took a much more positive tone, discussing the positive impacts of his policies on West Virginia, including a rebounding coal industry. 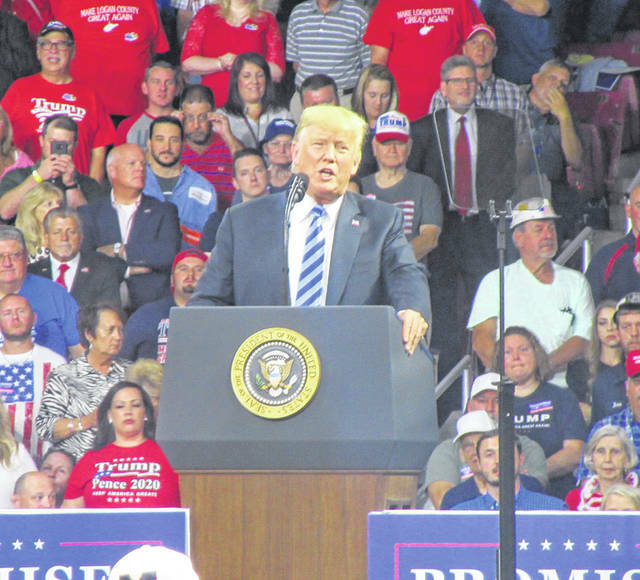 Turning his attention to the midterm elections in November, Trump brought U.S. Senate candidate, and current West Virginia Attorney General, Patrick Morrisey to the stage. Trump emphasized the importance of voting for Republican candidates, like Morrisey, who will support his agenda as President. “You aren’t just voting for a candidate. You’re voting for which party controls the House and which party controls the Senate,” said Trump. He added that one vote in the Senate can matter, making the Senate races particularly important. Making reference to the news out of Iowa earlier on Tuesday of an illegal immigrant having been arrested for the alleged murder of a college student, Trump noted the need to “build the wall” and secure the borders. Focusing in on immigration policy, Trump stated that a vote for Democrats would make the country less secure. “A blue wave in November means open borders, which means massive crime. A red wave means safety and strength,” said Trump. Trump praised the immigration and border patrol workers for their work to keep the country safe, as well as the nation’s law enforcement. “They uphold our laws and defend our communities like no one you’ve ever seen,” said Trump of the ICE workers. Of the successes in recent months, Trump noted that 4 million jobs have been created since the election, almost 3.9 million Americans are off food stamps as they are back to work and that manufacturing jobs are returning to West Virginia, Ohio, Michigan, Pennsylvania and other locations. 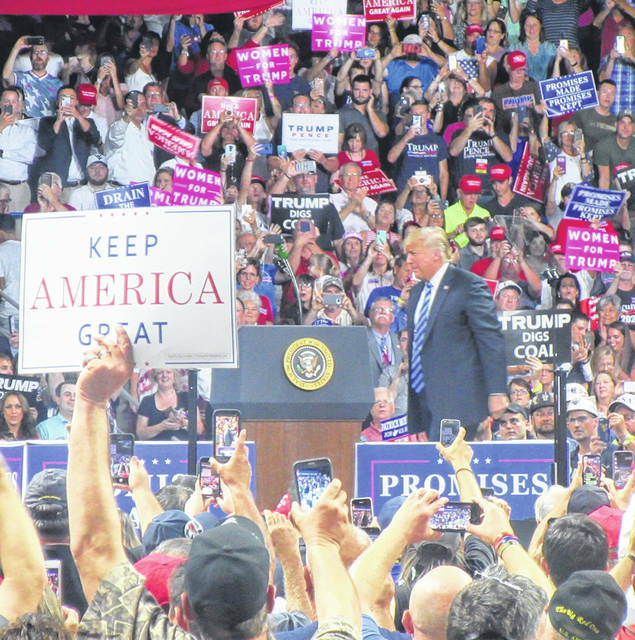 Trump promised he would be back in West Virginia leading up to the midterm election, as well as appearances in other places where his endorsement of candidates may have an impact.